I love Porgs. It probably has something to do with the fact that my two-year-old daughter loves them so much. She chirps and squeaks every time she sees one on TV or on a shelf in a store. I know there are plenty of Last Jedi haters out there that detest the little creatures, but I am who I am. 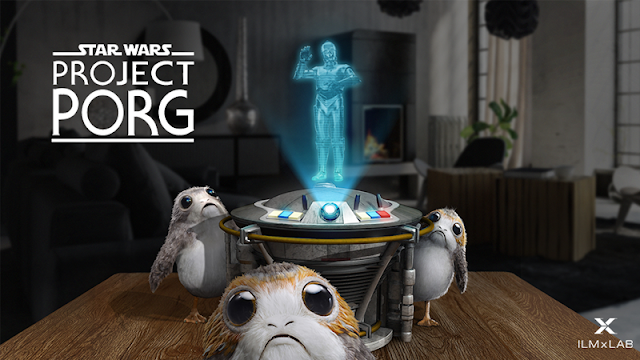 ILMxLab’s latest experiment in the world of mixed and augmented reality is coming in the form of a new experience dubbed, of course, Project Porg. Set to be officially unveiled at the upcoming Magic Leap Conference in Los Angeles, Project Porg tasks users, at the behest of C-3PO, with corralling a murder of Porgs (the official collective noun!) around their own real-world environment.